Haiti after the earthquake. I was invited to fly to the island and attend to medical needs. At a makeshift clinic, hastily set up in a cinderblock church, four nurses and I saw 250 patients a day, chased a couple dozen chickens from the examination areas over the course of an afternoon, and photographed many, including this girl. All of them, poorer than you can imagine (even with the help of the media’s graphic photos) were dressed in their finest. Most of the women had put on perfume. The children were respectful, obedient. Many of the men wore shoes. But I knew that, within a few days of our departure, the pills would run out and their situation would return to what it was before our intervention. What they needed, to block the return of intestinal parasites which drink their blood and sap their energy, to interrupt the malarial chills, to keep their babies alive into childhood, were just a few, simple inexpensive Public Health maneuvers. Put shoes (even cheap, plastic ones) on the kids to block the parasites from getting back into their bodies. Mosquito nets for their beds to keep the malaria out. 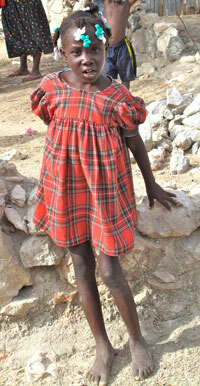 Drill a few wells for clean water, safe from diarrhea. Build latrines. But there’s no infrastructure there to put this together for the hard working rice farmers of rural Haiti. Partners in Health has a twenty year track record of success in a town called Cange. Dr. Farmer bit off a small geographical area and brought both medical care and Public Health to the neighborhood. Now he’s taught the Haitians to do it for themselves. It’s a model which may, like a benevolent tumor, spread to the rest of Haiti. I feel comfortable recommending that you donate to Partners in Health(www.pih.org). Your money will go where you want it to – directly to people like this girl, whose future may be better because of what you give.